I have a linked dipole with links for the 20m, 30m and 40m bands as well as extension pieces to bring it out to 80m. Would it be possible to make it resonate on the 60m band without having to cut and add links in the 80m sections to do so? I’d already experimented to see if I could reproduce the 30m tuning using just the 20m and 40m legs in an off-centre configuration. Would it tune on 60m if I set up with the 80m and 40m legs? Using one leg of the dipole at 20m (a quarter wave on the 80m band) and the other at 10m (for the 40m band) should give an antenna of 30m length. This is a half wave on the 60m band so should resonate. The feed point is about a third of the way along the dipole, quite common for off centre fed antennas. It is usual to use a 4:1 balun in this case to convert an expected impedance around 200Ω to match the 50Ω feeder. This antenna has a 1:1 choke balun and a 10m long feeder. 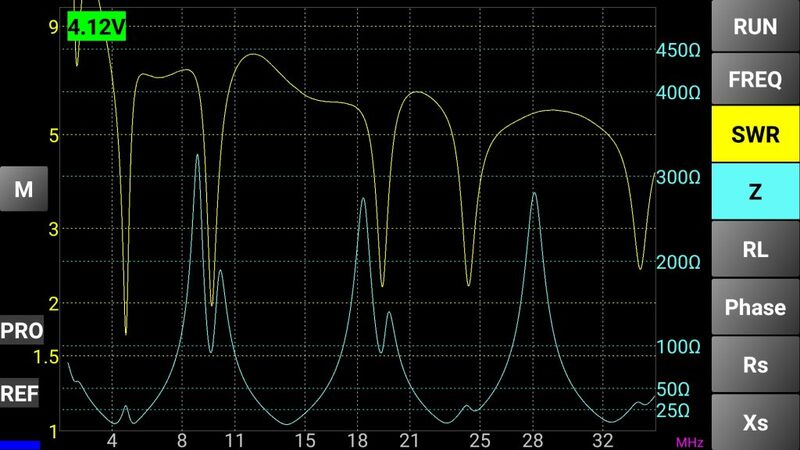 With a velocity factor of about 66%, the quarter wave feed line should transform the high impedance of the antenna into a low impedance which may be less efficient for the radio to match. We can see that the resonance is too low and, at the desired operating frequency around 5.5MHz the antenna return loss is at its maximum. The antenna has other resonances which may or may not be useful. 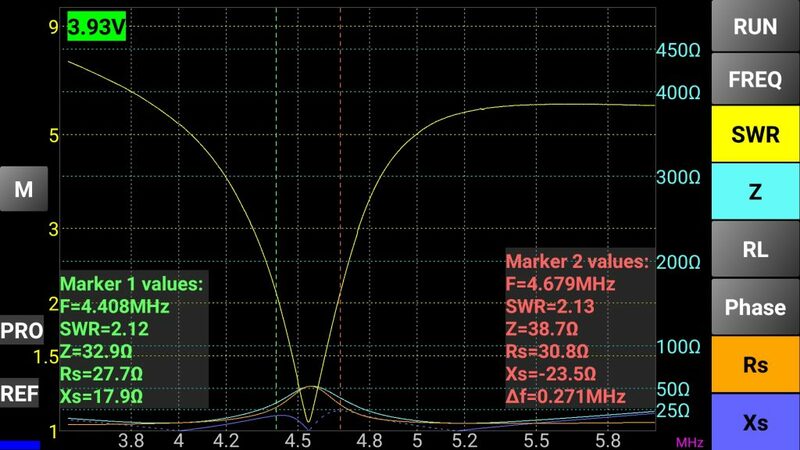 There is an amateur band around 24.5MHz which looks promising. The band at 18MHz may be just too low. This antenna may be usable to some extent on the 30m band at 10MHz, but my antenna has a good match for that section. I needed to raise the frequency. This can be achieved by shortening the cable, so I set the short leg to the 30m setting. This places the feed point closer to the end, so should further increase the impedance. The result with this setting suggests a match! Or at least a resonance assuming that the less power is reflected back the more is being absorbed and hopefully radiated by the antenna. 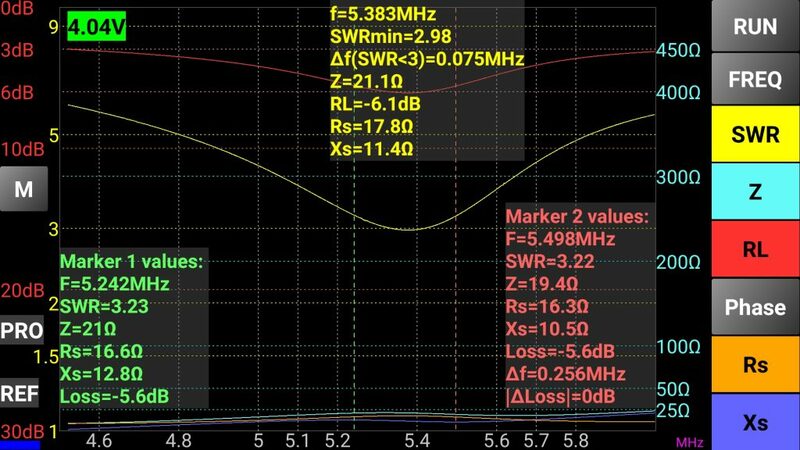 The reduction of SWR readings at higher frequency is taken to be due to losses in the system as frequency increases, with the thin coaxial cable not helping. The antenna seems to tune well at the desired frequency. The real test will be to get it on air. The return loss is given as -5.6dB which would imply that 25% of my transmitted power makes it back as reflected power having passed through the feeder twice. An Antenna Matching Unit should cause that to be reflected back passing through the feeder again in order to be radiated. The impedance at the radio is low – a magnitude of about 21Ω. This can be hard to match and should result in higher currents in the matching unit. The feeder is about a quarter of a wavelength long so a high impedance at the feed point will transform to a low impedance at the radio. A 4:1 balun at the feed point may help, but would be heavy and complex in comparison with cutting the wires and adding the links for 60m. An idea match would be a centre fed dipole that resonates on the 60m band. Dipoles can be tuned by folding back the wires, but this does not seem as effective as cutting them. It is far more temporary. So could I find a match by folding the 80m extension wires in half? 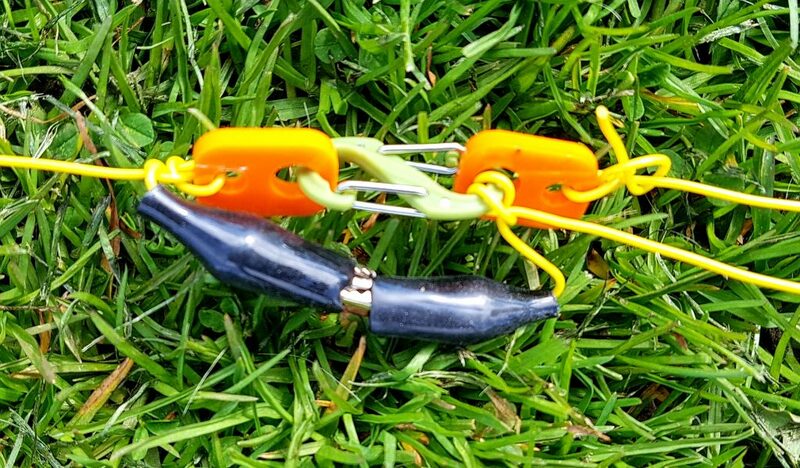 The end of the 80m section on the right is folded back and clipped to its mini-carabiner. The cable simply passes through the guy-line’s mini carabiner at the far end. The result was unfortunately too low a frequency. I tried folding back further to the 30m mark but the change was not significant. Folding back doesn’t seem a workable option. Can I assume that resonance occurs at the minimum SWR? Power is reflected when the impedance at a junction mismatches. This give SWR. 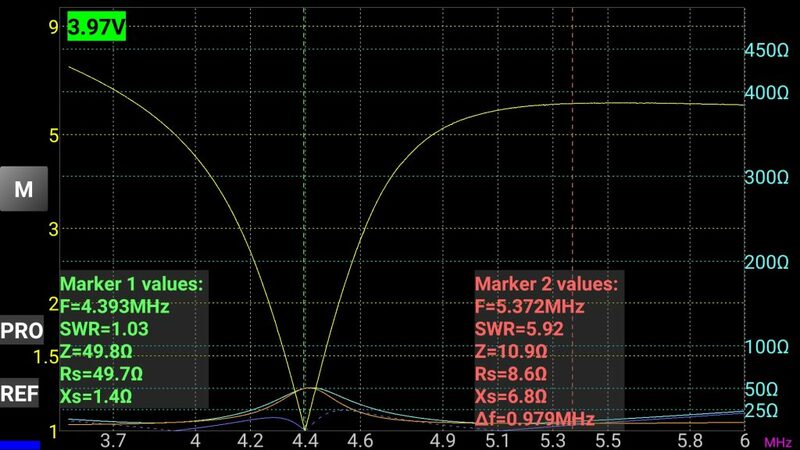 But will the SWR be lowest when an antenna is resonant, even if the antenna’s impedance is not a good match for the feeder? It would be nice to think so, because it would be nice to think that the resonating antenna is taking on the energy supplied to it and more efficiently radiating it. (Or warming up the daisies for an antenna so close to the ground). What is the current and voltage waveform at the feed point. The current waveform at the ends is zero. In the centre it is at its maximum. Is it in phase along the length? Or should I think of a travelling wave? The voltage waveform is maximum at the ends and minimum (but not zero) in the middle. The two ends are out of phase with each other. But does phase just flip in the middle? Henry Ott Consultants in their Dipoles for Dummies PDF model a dipole as a series RLC circuit. When not resonating it will have very high impedance due to the series inductance/capacitance. This will be transformed into low impedance by the 1/4 wave feeder which we can see in the Mini-VNA graphs above. 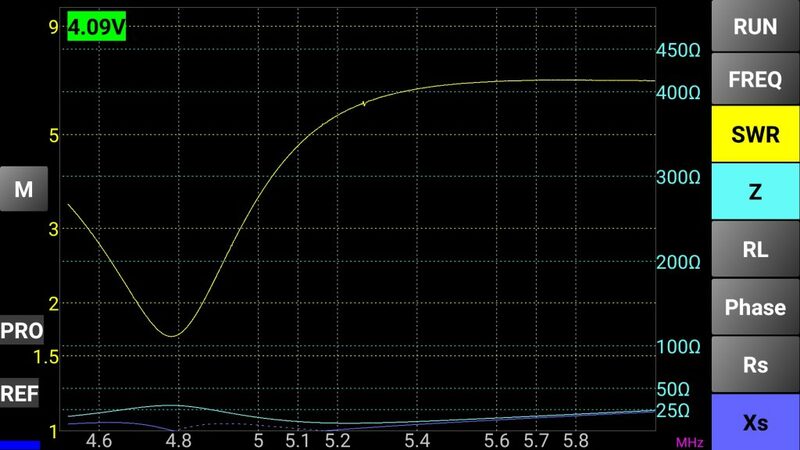 1/4 wave feeders are a bad idea if you want to use your antenna away from its resonant frequency, with the harder to match low impedance appearing as you move away from this point. At least the feeder is only a 1/4 wave or odd multiple of 1/4 wave at 5MHz, 15MHz, 25MHz, 35MHz. The only other band that I use that I may see this problem on is 20m. This entry was posted in Antennas, Radio. Bookmark the permalink.